Two outstanding quilt exhibits will be on display in Atlanta during the month of April. Gumbo: A Bit of This & That features the quilts of Marquetta Bell-Johnson and Aisha Lumumba at the Arts For All Gallery. The exhibit runs from April 3-25, 2008, and admission is free. The gallery is located at 57 Forsyth Street, downtown Atlanta. 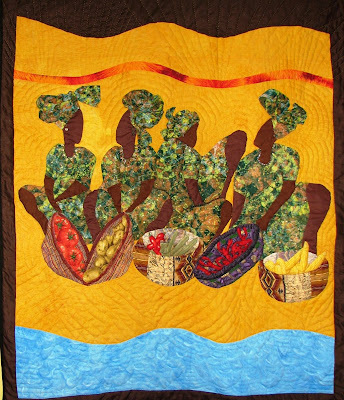 The quilt shown here is called Gumbo Ladies and was created by Aisha Lumumba. Across town, the members of the Sewjourners Quilt Guild will exhibit their quilts at the Southwest Art Center. This opening reception for this exhibit is April 11, 2008. The Southwest Arts Center is located at 915 New Hope Road, Atlanta, GA. Call (404) 505-3220 for more information.